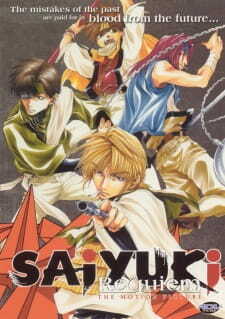 A most wonderful movie, Saiyuki: Requiem should be seen by fans of the Saiyuki series. But it is also a great movie for those that have never seen the series or for those that like their bishounen HOT. The story. I thought it was interesting in how the villian was in someway connected to Genjyo Sanzo and gang. Although the story could've probably been made into a 3 part episode (it also would've made a great filler). The sound. The music fit most of the scenes, and the voiceacting (in both the dub and sub) were phemominal. It saddens me that it was ADV Film's last job for Saiyuki, but at least they went out with a bang. The characters. The Sanzo Ikkoku are just as memorable as they are in the show. The villian and herione of the movie were wonderful. Although it hurts me that Kougaiji's gang wasn't able to catch up with Sanzo, though they do help explain the story of the herione. I really enjoyed this movie to bits and pieces (but that's because I am ahuge fan of Saiyuki), but like I said earlier, even non-fans would enjoy this feature. You don't need to see the series before you see the movie, but it does help. It's even better when you listen to the commentary.